N: Good standard /quality fruity malt. T: The competency continues along light sugar-sweet lines. 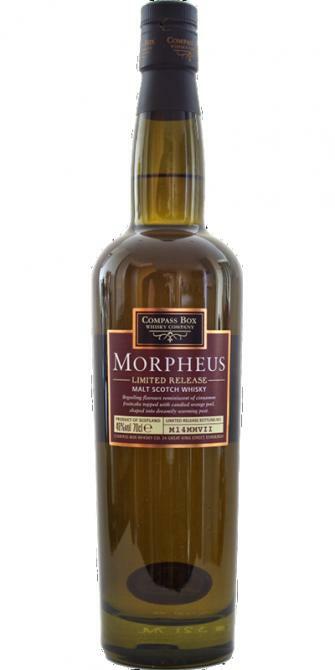 “Morpheus” (the Greek god of dreams) is a bespoke bottling made for Milroy’s of Soho in London. Working closely with their whisky buyer, we created a special bottling of just 176 cases. Availability:Available only through Milroy’s of Soho, London.176 cases (of six bottles) produced.Flavour DescriptorsPeaty and smoky with a sweet maltiness and hints of vanilla cream and citrus fruit.RecommendationsNeat or with water. Serve slightly diluted in a red wine glass with blue cheeses.Distillery SourcingMalt whiskies from the Highland villages of Kennethmont, Brora, Alness and Carron. Whisky ages between 10 and 14 years-old.WoodPrimary maturation in a mix of first-fill and refill American oak. Secondary maturation for 30% of the whisky on new American oak.Bottling DetailsBottled at 46%. Natural colour. Not chill filtered.